PGN Mentor - The world's best PGN utility. 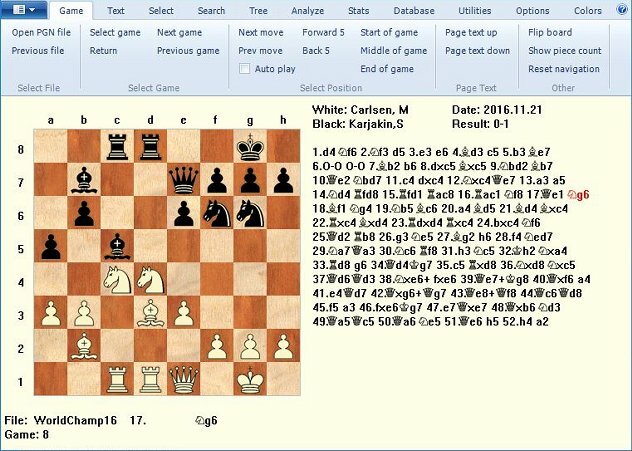 PGN Mentor is a database/study program that provides extensive functionality for viewing, searching, and analyzing chess games. Chess players and coaches around the world have been using PGN Mentor since 1998. In addition to the PGN Mentor software, this site is also home to the best collection of PGN files on the web. Visit our PGN Files page for free access to over a million Grandmaster games. You can try out the demo version of PGN Mentor before purchasing the full version. The demo has full capability for reading and viewing of PGN files, and full functionality for the demo PGN files. Also, a free companion PGN file to the book Garry Kasparov On My Great Predecessors, Part 1 is included with the demo download. Download PGN Mentor. Once you decide to purchase the program, your payment will be processed immediately and you will be able to download the software right away. Purchase PGN Mentor for only $25. Copyright © 2016 64 Squares.